This 2 day course AgilePM Foundation course, accredited by APMG International, and created in conjunction with the Agile Business Consortium, provides the world’s first independent certification in Agile Project Management. It provides delegates with an understanding of how the Agile Project Management process can enable planning, management and control of successful and well-controlled Agile projects. The course is delivered by highly experienced trainers approved by APMG International and is a blended course including practical workshops during classroom training. The course provides the opportunity to gain certification at Foundation level. Delegates will be provided with some pre-reading materials prior to the course and a comprehensive delegate pack including the AgilePM Handbook when attending the event. The course is aimed at Project Managers who are operating in an agile environment running more complex and scalable projects and Team Managers operating in Agile projects. Estimation & Measurement; Quality & Maintainability; Planning, Control & Risk; Implementing AgilePM. To give delegates a practical understanding of Agile Project Management based on the internationally recognised framework of DSDM Atern. 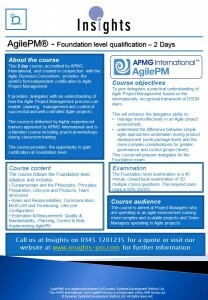 The AgilePM® Foundation level examination is a 40 minute, closed book examination of 50 multiple choice questions. The required pass mark is 50% (25/50). AgilePM® is a registered trademark of Dynamic Systems Development Method Ltd. The APMG-International Swirl AgilePM Device is a trade mark of the APM Group Ltd.
© Dynamic Systems Development Method Ltd. All rights reserved. I felt it met all my requirements and answered everyquestion and was very well done.